Children face difficult times throughout their lives -- fighting with good friends, losing an animal you love, conflict at home, struggles with schoolwork. Figuring out how to keep hope alive in the face of these difficulties is a crucial part of growing up. 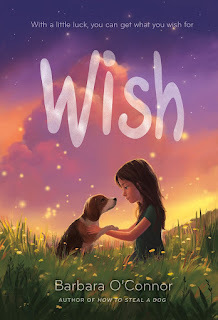 Charlie faces a heap of trouble in Barbara O'Connor's book Wish, but each and every day she makes a wish. Through her stubborn, fiery personality (or maybe despite it? ), she keeps hope that her life will get better. This was a perfect book to read at the end of this turbulent year -- I hope you find hope in its pages. Eleven-year-old Charlie Reese is sent to live with an aunt and uncle she's never met before when her family falls apart. Her father is in jail, and her mother won't get out of bed, so Charlie must stay with Aunt Bertha and Uncle Gus until her mother can get her "feet on the ground" again. Charlie feels forgotten, dumped in a small town far away from everything that she knows, while her sister gets to live with her best friend. Charlie struggles with her "fiery red temper," with her anger, with her worries. Young readers will relate to these feelings--worrying that her mama won't get better, or feeling angry that everyone is ignoring her. "What was I doing there on that porch with these people I didn't even know? I felt like I'd been tossed out on the side of the road like a sack of unwanted kittens." Every day, Charlie makes a wish--she has a whole list of all the different ways to make a wish, "like seeing a white horse or blowing a dandelion." She never tells anyone what her wish is, but readers quickly realize it's to live with her family, to go home. But what do you do when your wish doesn't come true? Things start to turn around when Charlie befriends a stray dog she names Wishbone. "I knew what it felt like to be a stray, not having a home where somebody wanted you. And he was a fighter. Like me. That dog and I had a lot in common. I was suddenly overwhelmed with love for that skinny dog." O'Connor skillfully develops this story, showing Charlie's struggle in her new home, the way she's so stubbornly focusing on what she doesn't have that she doesn't see the goodness of her new home. Instead of becoming sappy, this story resonates with poignant vulnerability and the power of friendship. "Helping our students cultivate hope might be one of the most important things we do for them. Not only will it help them get more A’s in the short-run; it’ll give them the confidence and creativity to reach their long-term goals in school and in life." I want to send special thanks to Kirby Larson for recommending this book to me--she's so right that it quickly became one of my favorites this year. Share this with children who have loved reading realistic stories like RJ Palacio's Wonder or Lynda Mullaly Hunt's Fish in a Tree. The review copy came from my public library. If you make a purchase using the Amazon links on this site, a small portion goes to Great Kid Books. Thank you for your support. If you celebrate Christmas, are there special books that you read each year? Our family reads The Night Before Christmas every year, snuggling in bed together--and yes, our teens still clamber in our bed to share this tradition. 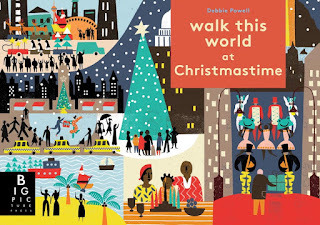 Three new picture books make a delightful way to share Christmas traditions. 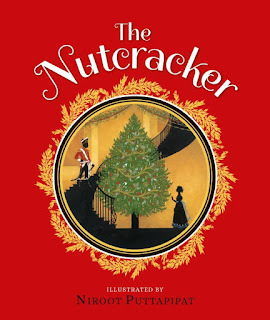 The original Nutcracker story and the ballet that developed from it are skillfully retold in this picture book, but it's the illustrations that will draw readers back to it again and again. Puttapipat sets black cut-paper silhouette figures against jewel-toned scenes, creating a sense the formal ballet and the intimate, magical story. The longer text makes this more suited for older children. "They traveled by swan over gold-flecked oceans and silver-edged cities. Clara held her breath, her eyes wide. As she gazed at the twinkling lights far below, snowflakes pirouetted past." The climax, as Clara and her prince enter the Sugar Plum Fairy's castle, reveals itself as the majestic ball unfolds in a double-page pop-up construction. For a fuller look at this beautiful book, read the review at What to Read to Your Kids. Head over to Fuse 8 to see a terrific range of Nutcracker stories. 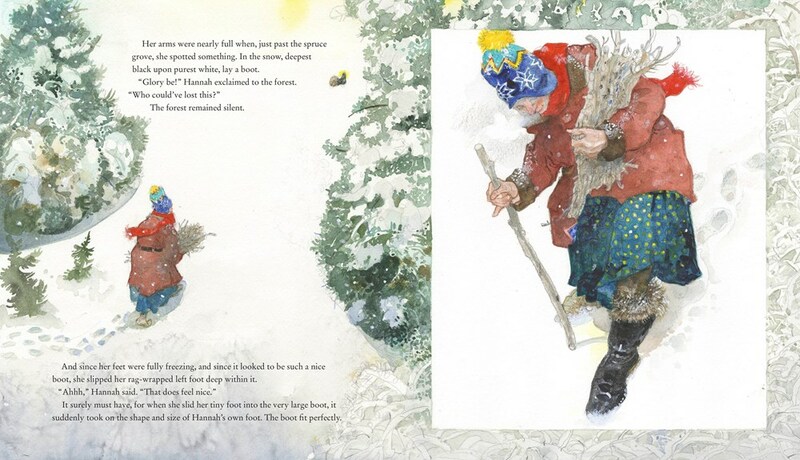 Elderly Hannah Greyweather sets out one winter day to collect firewood, when she discovers a solitary boot in the snow. When she tries it on, the boot immediately changes shape to fit her foot--it's the first sign that magic has touched this boot. "'Such a magnificent find,' she said to the left boot. 'Who could have lost such a treasure as you?'" The next morning, the boot's mate appears by her bed and Hannah goes out to do her chores, her feet wonderfully warm. "Her arms were nearly full when, just past the spruce grove, she spotted something. 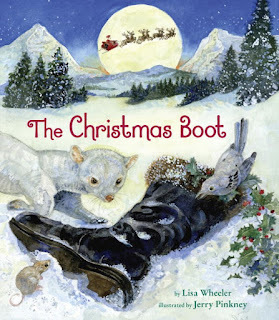 In the snow, deepest black upon purest white, lay a boot." As the days progress, Hannah discovers more gifts magically appear. Young readers will gasp and smile with knowing pleasure when a visitor knocks on Hannah's door, wearing "a red hat, a red suit...and one black boot." Although the text never names this visitor as Santa Claus, young readers will enjoy seeing how he works his magic--asking Hannah whether there's anything he can give her. Jerry Pinkney's watercolor illustrations bring warmth, gentle humor and holiday spirit to this touching story. 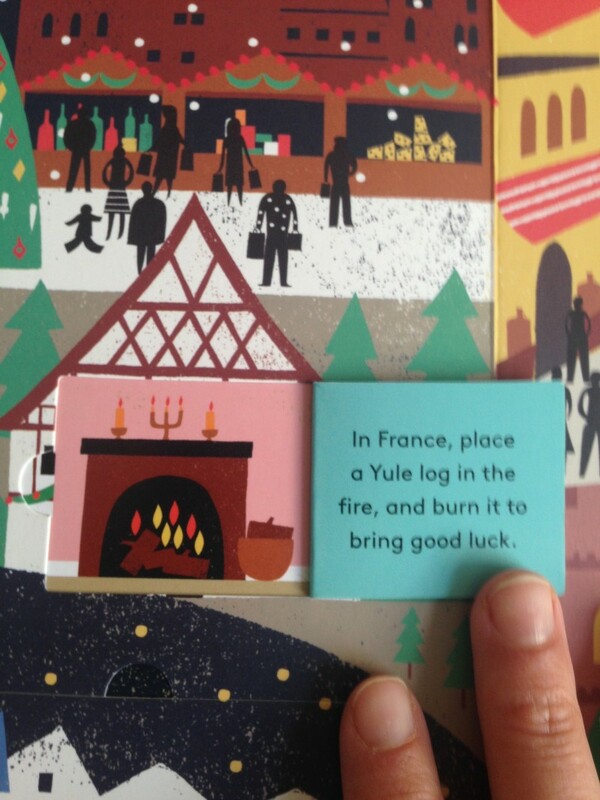 and burn it to bring good luck." Readers take a tour of the world and see Christmas celebrations from fireworks, Las Posadas and piñatas in Mexico, Bolivia and Brazil to Yule logs, hidden toys in candied cakes and Three Kings Day in Spain, France, Italy and Greece. Each detailed double-page spread focuses on countries in a region with overlapping traditions. 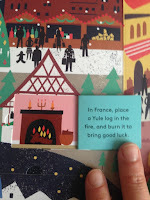 Readers are invited to lift little flaps, numbered in the tradition of an advent calendar, to reveal images and small facts. The tour starts in America, travels south to Central and South America, and then travels to Africa, Europe and the Middle East. The tour ends with Asia and then Australia, New Zealand and Samoa. 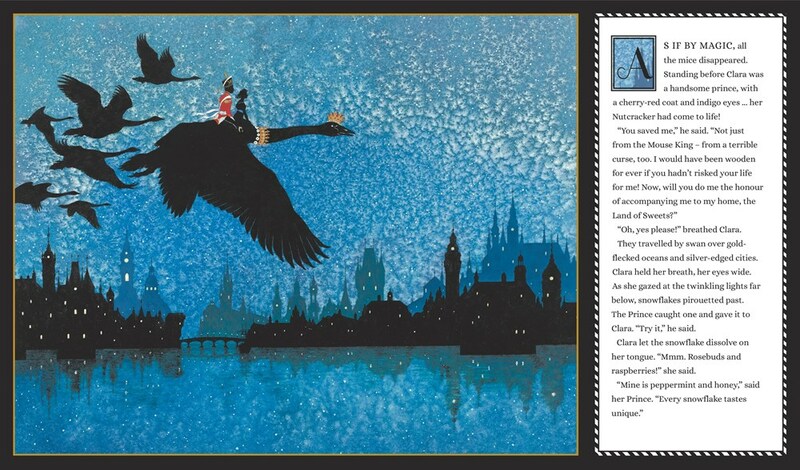 The final spread shows a world map, asking young readers to trace their journey. I especially love how this creates a worldview that is not just centered on European traditions. Illustrations © Niroot Puttapipat, 2016; © Jerry Pinkney, 2016; and © Debbie Powell, 2016. The review copies were kindly sent by the publishers for review. If you make a purchase using the Amazon links on this site, a small portion goes to Great Kid Books. Thank you for your support. Reading picture books with children brings me so much pleasure. I love it when they really get the big ideas--the surprising, unexpected ideas that authors and illustrators layer in their books--even when they haven't yet developed sophisticated language to describe these ideas. In Real Cowboys, Kate Hoefler and Jonathan Bean ask young readers to reconsider the stereotype of a macho cowboy. It's an evocative look at working on the range, a picture book I find myself thinking about over and over again. Right from the cover, my students could tell that this cowboy was concerned and worried about the animal he was holding. They noticed the cowboy's expression and the way he was holding the calf, with his arms wrapped around it--and they could imagine a story behind this picture. Hoefler's text flows gently as we start to read the book. Real cowboys, she tells readers, are quiet, thoughtful, gentle, and careful. They stay with their cattle on long rides, through day and night. While the text encompasses all cowboys, Bean's illustrations help young readers see a more distinct story, following a specific cowboy, his herd and his team through their work. "Real cowboys are gentle. They know all of the songs that keep cattle calm, moving out of storms, along dirt roads and narrow canyons." Bean uses color to show the passing of time, from day to night as well as changing weather and seasons. The striking color palette creates a sense of pacing as each page changes. Students also noticed that time passes slowly sometimes, as cowboys stay with their herds through tough times. "They're on cattle drives for hours, or days, or weeks, but they don't mind. Real cowboys are patient." My students loved the layered effect of Bean's stencil artwork. They noticed how you saw perhaps the same cowboy moving across the page above, slouching over more and more as he makes his way across the page. They liked looking for different shapes in the shadows. I'm looking forward to showing them some photographs when he was creating this work, over at Seven Impossible Things Before Breakfast. 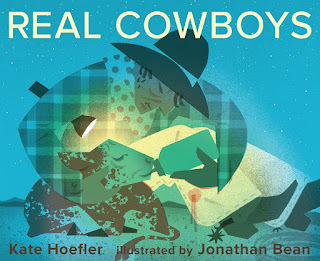 My 3rd graders were not quite able to put into words how this picture book challenges the stereotypes of cowboys, but they definitely got the message that Hoefler and Bean want us to think as cowboys as caring, thoughtful and patient--and not just rushing around on horseback, chasing cattle. Even more importantly, they could make connections to how they want to act in their own lives, how they want to treat others and care for animals. As we ended the story, a quiet hush fell over the room. It was a beautiful moment. Illustrations © Jonathan Bean, 2016. The review copy was purchased for our school library. If you make a purchase using the Amazon links on this site, a small portion goes to Great Kid Books. Thank you for your support. 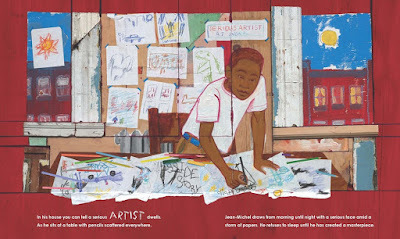 I firmly believe that picture books give children their first experience seeing and thinking about art. 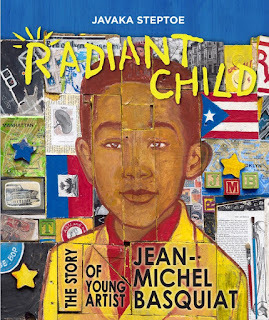 Radiant Child, by Javaka Steptoe, is an amazing new picture book about the life of Jean-Michel Basquiat. I especially love the way that Steptoe shows children how art has the power to inspire and heal. At the same time, he shows a revolutionary artist celebrating his neighborhood, infusing it with vibrant, colorful art. Start with a careful look at the cover and see what details you notice. A flag from Puerto Rico on one side. Do you see the flag from Haiti on the other? We see several stars. The initials JMB. Do you notice the word "radiant", with the lines shining out from the R? Look closely and see the pieces of the painting put together, like shingles on the side of a building. 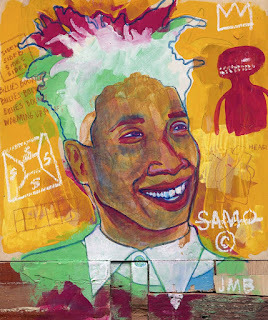 Javaka Steptoe introduces children to Jean-Michel Basquiat, a modern American artist who was "known for his charisma, energy, and bold, captivating art." Steptoe focuses on Basquiat's childhood and entry into the art world, helping young readers see in themselves the potential for becoming professional artists. As a young child, Jean-Michel drew with passion and focus, drawing "from morning until night with a serious face amid a storm of papers". "His drawings are not neat or clean, nor does he color inside the lines. They are sloppy, ugly, and sometimes weird, but somehow still BEAUTIFUL." Jean-Michel's mother encouraged him to create art from a young age, lying on the floor to draw alongside him. Jean-Michel was badly hurt in a car accident as a young boy, and art helped him heal. But when his mother suffered from mental illness and had to leave the family home, Jean-Michel was heart-broken. One of my students commented that Steptoe pieced together his paintings from scraps of wood the same way that Basquiat tried to piece together his life using art. Oh-wow-oh-wow, what a powerful idea. "Basquiat's success seemed to me to begin an era of inclusion and diversity in fine arts where there had been little to none. This meant as a young African American artist coming up that my chances of having my voice heard and achieving mainstream success were majorly expanded...I wanted to help young people connect with his art the way that I had." This is a fascinating picture book, one that I've found myself going back to again and again. I'm excited to share it with our art teacher at school, hear what conversations she has with her students, and see the artwork they create after looking more closely at Basquiat's paintings. A striking and thoughtful look at a unique artist. Illustrations © Javaka Steptoe 2016. The review copy was kindly sent by the publisher, Little Brown, and we have purchased multiple copies for our library. If you make a purchase using the Amazon links on this site, a small portion goes to Great Kid Books. Thank you for your support. What makes kids want to read? Books that are fun to read! Over 70% of kids (in the Scholastic Kids & Family Reading Report) say that they want books that "make them laugh." This is especially true for kids just beginning to read. 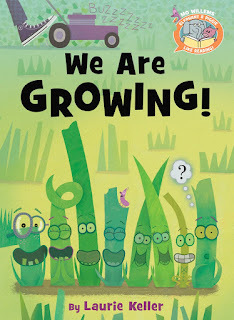 A new favorite is Laurie Keller's We Are Growing!, part of the new Elephant & Piggie Like Reading! series. Our 1st graders love-love-love Elephant & Piggie books, and they are excited to meet these new friends. With over-the-top emotions, several blades of grass share their excitement as they grow taller and taller. "Bam! Whee! Zap!" exclaim the shoots of grass as they sprout up. Readers will giggle as they watch these goofy leaves grow. With kid-appropriate enthusiasm, they brag about what makes them special. "I just grew. All by myself. Cool, huh?" "I know, I know. I made it look EASY." I also love how Keller taps into the way kids are amazed at their own growth process. Just talk to a 1st grader when they loose a tooth -- it's so exciting, because it shows they're growing and their body is changing. Even when the lawn mower chops them down to size, the grass blades grow again. She also taps into kids' competitive spirit, but shows that everyone has a different feature that makes them special. Adults might find this corny, but kids love it. "This book is the FUNNIEST!" If you like the Elephant & Piggie series, you'll love this new addition. Definitely also check out Dan Santat's The Cookie Fiasco, another new entry in Elephant & Piggie Like to Read! 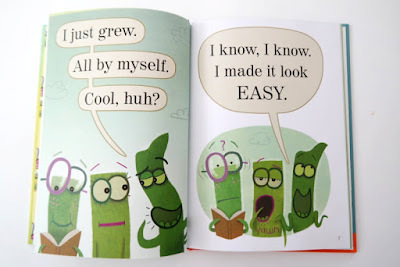 With Mo Willems' clear editorial guidance, this series is continuing his standout tradition of easy readers that bring on the giggles and make kids want to read. Illustrations © Laurie Keller 2016. The review copy was kindly sent by the publisher, Disney-Hyperion. If you make a purchase using the Amazon links on this site, a small portion goes to Great Kid Books. Thank you for your support.